Not to be confused with Herodas. For Herodias as a medieval goddess of witchcraft, see Aradia. For the Jules Massenet opera, see Hérodiade. For the asteroid, see 546 Herodias. Herodias (Greek: Ἡρωδιάς, Hērōdiás; c. 15 BC — after 39 AD) was a princess of the Herodian dynasty of Judaea during the time of the Roman Empire. Daughter of Aristobulus IV and his wife Berenice. Full sister to Herod V (king of Chalkis), Herod Agrippa (king of Judea), Aristobulus Minor, and Mariamne III (wife of Crown Prince Antipater and, after his execution by Herod the Great, she was possibly the first wife of Herod Archelaus, principal heir of Herod the Great and ethnarch of Judea). Herod the Great executed his sons, Alexander and Aristobulus IV, in 7 B.C., and engaged Herodias to Herod II (born - ca. 27B.C. ; died - 33A.D. ), her half-uncle. The marriage was opposed by Antipater II, Herod the Great's eldest son, and so Herod demoted Herod II to second in line to the throne. Antipater's execution in 4 B.C. for plotting to poison his father left Herod II as first in line, but his mother's knowledge of the poison plot, and failure to stop it, led to his being dropped from this position in Herod I's will just days before he died. The Gospel of Mark states that Herodias was married to Philip, therefore some scholars have argued his name was Herod Philip (not to be confused with Philip the Tetrarch, whom some writers call Herod Philip II). Many scholars dispute this, however, and believe it was an error, a theory supported by the fact that the Gospel of Luke drops the name Philip. Because he was the grandson of the high priest Simon Boethus he is sometimes described as Herod Boethus, but there is no evidence he was called by that name. There was one daughter from this marriage, Salome. Herodias's second husband was Herod Antipas (born before 20 B.C. ; died after 39 A.D.) half-brother of Herod II (her first husband). He is best known today for his role in events that led to the executions of John the Baptist and Jesus of Nazareth. Antipas divorced his first wife Phasaelis, the daughter of King Aretas IV of Nabatea, in favor of Herodias. According to biblical scholars, the Gospel of Matthew  and the Gospel of Luke, it was this proposed marriage which John the Baptist publicly criticized. Besides provoking his conflict with the Baptist, the tetrarch's divorce added a personal grievance to previous disputes with Aretas over territory on the border of Perea and Nabatea. The result was a war that proved disastrous for Antipas; a Roman counter-offensive was ordered by Tiberius, but abandoned upon that emperor's death in 37 A.D.. In 39 A.D. Antipas was accused by his nephew Agrippa I of conspiracy against the new Roman emperor Caligula, who sent him into exile in Gaul. Accompanied there by Herodias, he died at an unknown date. It is uncertain if Herodias had any children by her second husband, Herod Antipas. In the Gospels of Matthew and Mark, Herodias plays a major role in John the Baptist's execution, using her daughter's dance before Antipas and his party guests to ask for the head of the Baptist as a reward. According to the Gospel of Mark, Antipas did not want to put John the Baptist to death, for Antipas liked to listen to John the Baptist preach (Mark 6:20). Furthermore, Antipas may have feared that if John the Baptist were to be put to death, his followers would riot. The Gospel of Matthew amplifies the role of Herod by omitting these details. Some biblical scholars have questioned whether the Gospels give historically accurate accounts of John the Baptist's execution. According to the ancient historian Josephus, John the Baptist was put to death by Antipas because he feared the prophet's seditious influence. Some exegetes believe that Antipas' struggle with John the Baptist as told in the Gospels was some kind of a remembrance of the political and religious fight opposing the Israelite monarchs Ahab and Jezebel to the prophet Elijah. In medieval Europe a widespread belief held Herodias to be the supernatural leader of a supposed cult of witches, synonymous with Diana, Holda and Abundia. Together with Salome, Herodias was a frequent subject in images of the Power of Women topics in the later medieval and Renaissance period. 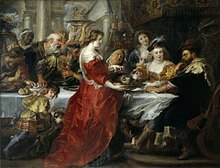 The most common moment shown including Herodias is the Feast of Herod, showing Salome presenting John's severed head on a platter as Herodias dines with her husband and others. Hérodias, story by Gustave Flaubert, one of the Three Tales (Trois contes), published in 1877. Hérodiade, opera by Jules Massenet, based on the story by Gustave Flaubert. Hérodiade, ballet by Paul Hindemith. Hérodiade, oil painting by Aimé Morot. Salomé, play by Oscar Wilde, French (1894), translated into English by Lord Alfred Douglas, 1895. Salome, opera by Richard Strauss, based on a German translation (by Hedwig Lachmann, grandmother of Mike Nichols) of the play by Oscar Wilde. Salomé, an opera by French composer Antoine Mariotte, set to a French libretto based on Oscar Wilde's play. Salome: The Wandering Jewess. My First 2,000 Years of Love, by George Sylvester Viereck, 1930. Salome, song by Irish rock band U2. In Parsifal, the opera by Richard Wagner, the lead female character of Kundry is revealed to be Herodias, in the second act. In the opera she was said to have laughed at Christ when she saw him being crucified and was cursed with immortality. She eventually finds redemption through the actions of Parsifal. ^ However, it is possible Luke omitted the name as unimportant to the account. Harold Hoehner, Herod Antipas: A Contemporary of Jesus Christ (Zondervan, 1983), page 132 - 134. ^ Florence Morgan Gillman, Herodias: at home in that fox's den (Liturgical Press, 2003) page 16. ^ Meier, A Marginal Jew: Rethinking the Historical Jesus, Volume Two: Mentor, Message and Miracles. Anchor Bible Reference Library, New York: Doubleday, 1994, pp. 171-176. ^ Ginzburg, Carlo (1990). Ecstasies: Deciphering the witches' sabbath. London: Hutchinson Radius. ISBN 0-09-174024-X. Wikimedia Commons has media related to Herodias.